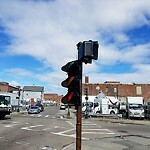 Signal problem: Traffic | Type of problem: Other | Pole knockdown: No | Details: Speed limit indicator that is broken. It snapped off the light pole and is now hanging by just the wire. Signal problem: Traffic | Type of problem: Other | Type of pole: Vertical Pole | Pole knockdown: Yes | Details: BFD reporting traffic pole knocked over onto the sidewalk and the rest of the signals are now out. Notified Dagle 5:35 AM.